Thanks to Poison Ivy's fast work, the podcast of last night's show is already available here if you want to listen to it right now. It will also be available on iTunes and my web site shortly. 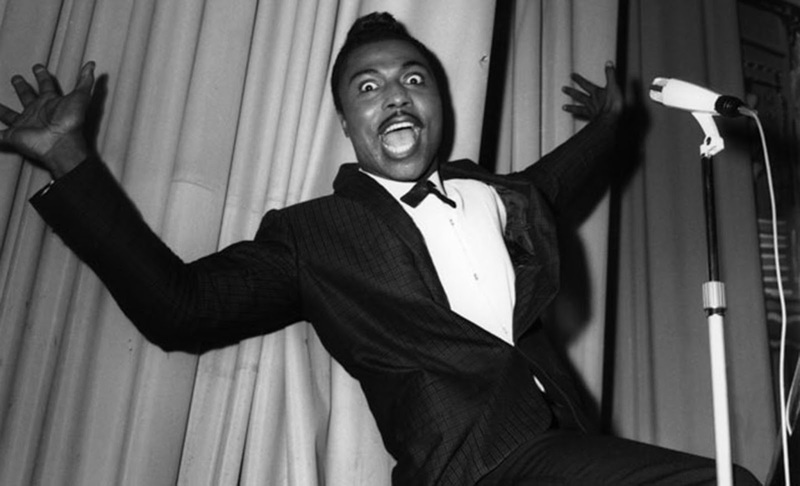 Here are the songs from last night's show (January 22). Jittery Jack “See You Friday” from Gonna Have a Time with Jittery Jack on Annabelle Records — Check out the tour dates for Jittery Jack and Miss Amy—they’re heading out across the U.S. and will be kicking off the tour with a hometown show on 2/26 at O’Brien’s in Allston! I hope you are all faring well this month. If you're bugged by the winter blues we've got a few things coming up to boost your spirits (and put some groove in your Sacroiliac)! Read on! 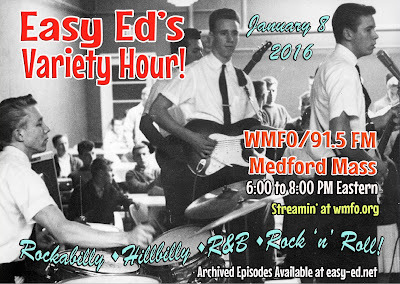 In addition to the radio show, "Easy Ed's Variety Hour," I DJ around town and also promote musical events in the Boston area. 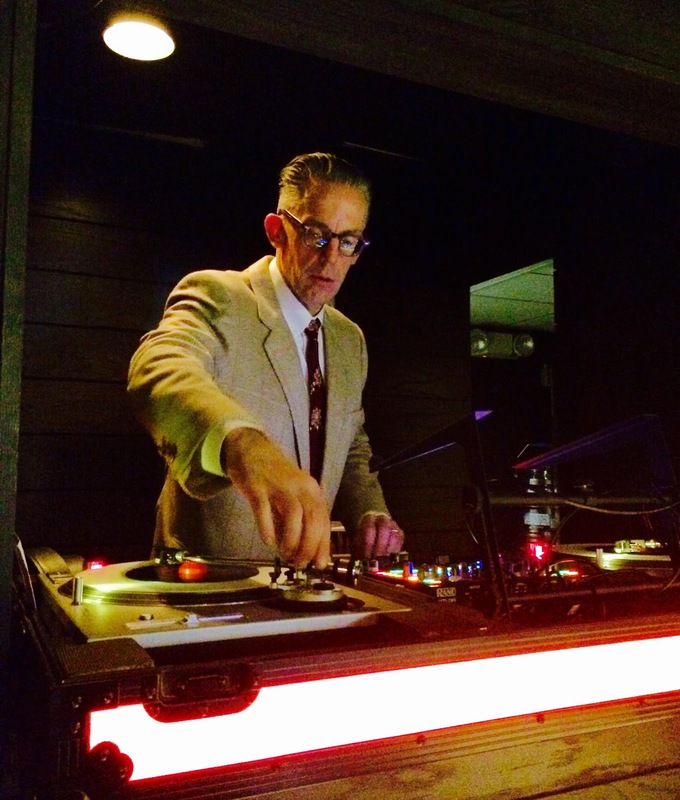 The longest standing of my DJ gigs is "Primitive Sounds," which I cohost with P.J. Eastman at River Gods in Cambridge (125 River Street). Each time we invite a guest from the local music world to join us. This Wednesday (January 20) I'll be spinning the hot wax with James Reed, and we're thrilled to have him back as our guest in the DJ booth. 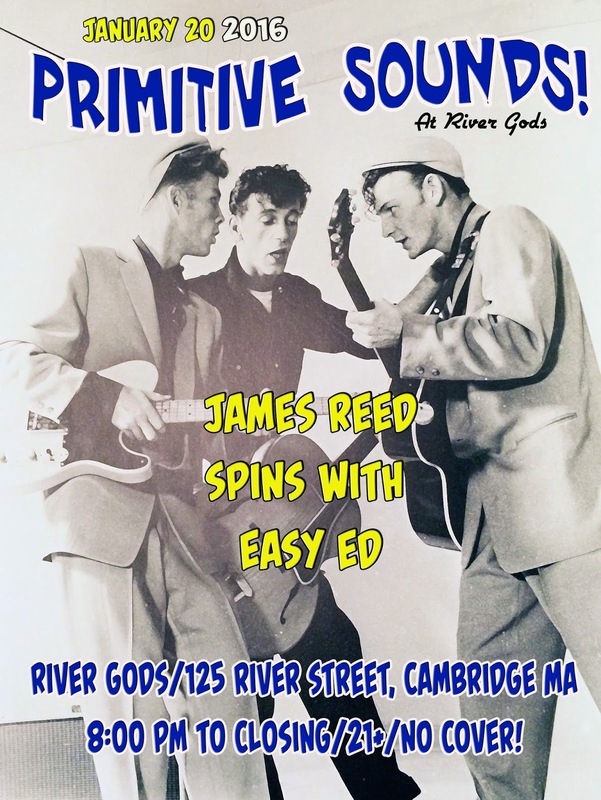 A longtime Boston Globe music critic and all-around roots music aficionado, James always spins the sounds that astound. He and I will alternate sets throughout the night. River Gods is a fun and friendly room with excellent food and cocktails. The records spin from 8:00 PM to closing. You can learn more here! 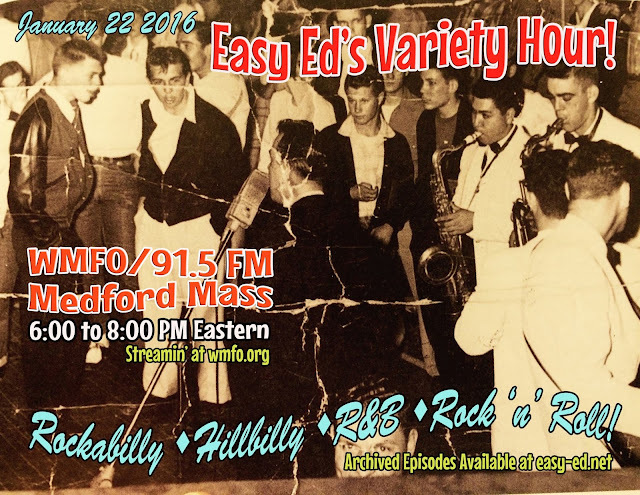 On Friday January 22 "Easy Ed's Variety Hour" will be back with two big hours of rockabilly, hillbilly, R&B, and rock 'n' roll! We roll from 6:00 to 8:00 PM Eastern, and you can listen live on WMFO 91.5 FM (streaming worldwide at wmfo.org). 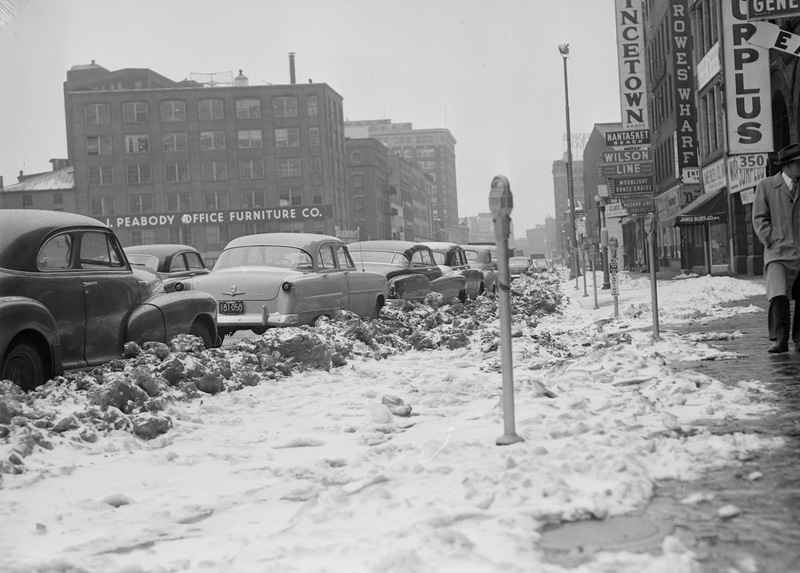 Archived episodes are always promptly posted to easy-ed.net so you can catch the show whenever you want! And, if you like what you hear on the show, please drop us a line at our Facebook page--we love to know who's listening. Thanks! On my last two radio broadcasts I’ve played songs by an exciting English band called the Retrobaits—the original “Your Squeezes Don't Leave Me,” and an excellent cover of the Bob Doss Starday classic “Don't You Be Gone Long.” These tracks have a traditional rockabilly sound balanced with freshness and energy that really caught my ear. If I had the dough I’d bring these guys on over to Boston for a huge rockin’ show! For now, though, I was able to interview bass player Stuart Bates to learn more about the band. So far the band has recorded four songs (two originals and two covers), which are out now in limited-edition CD release. They recorded at Western Star Recording Studios and credit engineer Alan Wilson for helping them get the sound they wanted. The band will be back in the studio in March to record a full album, which is due out on the Western Star label later in 2016. David Yates: “The material for the forthcoming album will be a band collaboration consisting of a mixture of life experiences, our conversations with people along the way, and a bit of nonsense all thrown in!” For now you can check out the band’s Facebook page for information about purchasing their recordings. The Retrobaits are a fantastic addition to the rockabilly world, and are clearly going places fast. I only hope that a U.S. tour happens someday, and that Boston is the first stop! 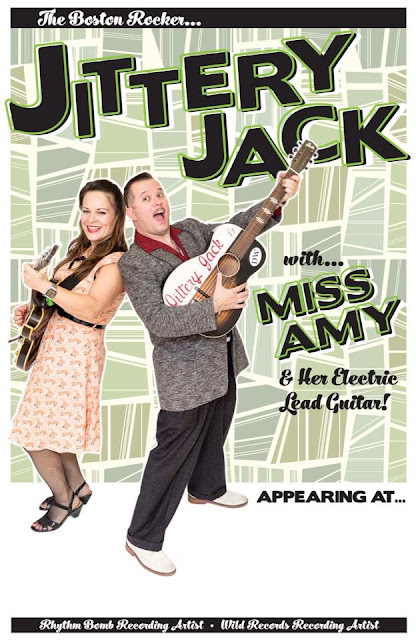 Speaking of tours, Boston rockabilly sensations Jittery Jack and Miss Amy are heading out on an extensive U.S. jaunt that kicks off in February. See the dates below, and be sure to go see them when they come your way. These are fantastically talented musicians who always put on a great rockin' performance. I want to thank these guys for inviting me to DJ at their February 26 show at O'Brien's in Allston. We're gonna send them off in style! I'm excited say "Easy Ed's Variety Hour" is heading into its tenth year. Hard to believe, but calendars don't lie! To celebrate, we're planning a special live event for later this year. We'll have multiple bands on the bill; it's gonna be a real blowout. Details to come soon. 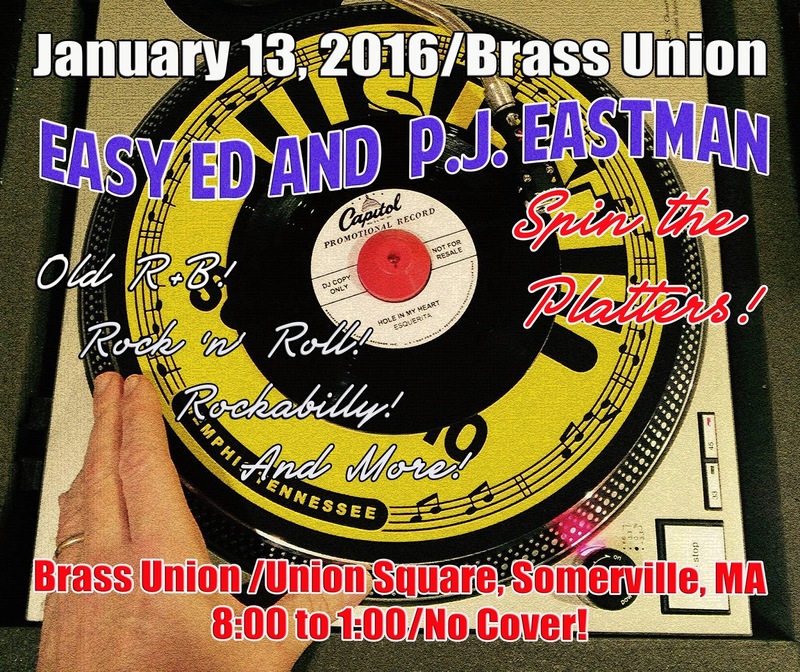 Much sooner--this coming Wednesday, January 13--I’ll be spinning records with my good buddy P.J. Eastman at Brass Union in Somerville. We start at 8:00 PM and roll until closing. Brass Union is cool little nightspot with a fantastic sound system, great food and drink, friendly staff and patrons, table games, dance floor, and more! See you there!